From planning to construction, it requires many roles to take a house from blueprint to reality. One of the key features of the U.S. Department of Energy’s Solar Decathlon is the realistic experience it provides to participating students. The Solar Decathlon is a uniquely large-scale university design-build competition, offering theory-to-practice opportunities for student teams and a fascinating learning experience for those visiting this free event in Denver, Colorado. Ten contests evaluate various aspects of energy-efficient, solar-powered houses, which teams have spent nearly two years designing, refining, and building. 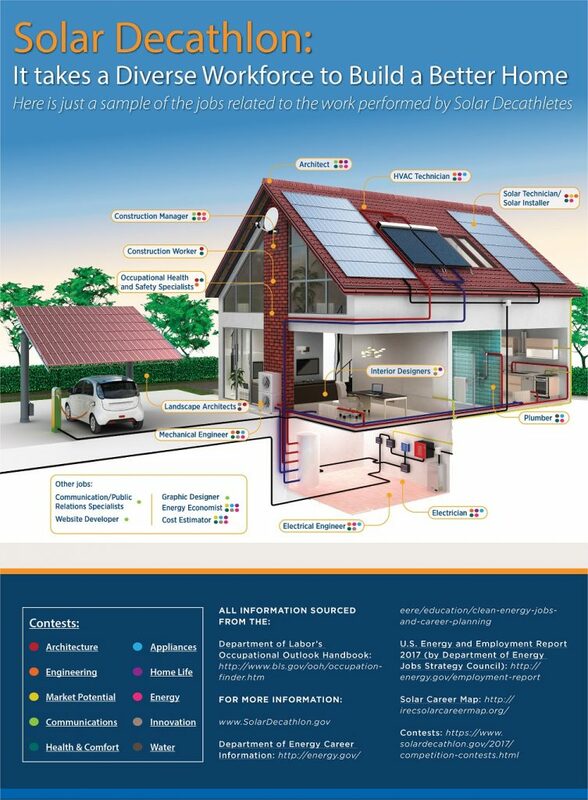 The Energy Department (DOE) created this new infographic below that explores the range of jobs connected to the 10 contests that form the Solar Decathlon. The information available through the infographic can be of interest whether one is graduating from college or thinking about transitioning careers. While the infographic does not display all jobs in the energy and buildings industries, it gives a sense of the wide range of jobs and skills covered by the competition. According to the Energy Department’s 2017 U.S. Energy and Employment Report, the renewable energy and energy efficiency sectors are among the fastest growing parts of the U.S. workforce. Solar industry jobs jumped almost 25% in 2016 and wind employment increased by 32%. Bioenergy and geothermal sectors continued to employ thousands of Americans. Energy efficiency, which accounts for almost 2.2 million jobs, is projected to have a 9% employment growth in 2017 as more Americans reduce their energy consumption to save money. In conjunction with this rapid growth, the DOE report found that 73% percent of all surveyed employers said they’re having difficulty hiring qualified workers across the energy sector. The Solar Decathlon helps address this difficulty by challenging student teams with a real-life, complicated project that provides hands-on training for undergraduate and graduate students. DOE has sponsored the creation of several career maps for solar, wind, and bioenergy that contain further resources for those wanting to navigate their potential opportunities. In addition, DOE’s Better Buildings Program provides information about jobs and skills needed in the energy efficiency and building science sectors. These tools show that there are options for people of all educational backgrounds to join the clean energy workforce. Entry-level positions such as wind technicians and solar site assessors can be achieved through workforce training through community colleges or labor training centers, with certifications that allow for dynamic, hands-on work. According to the U.S. Energy and Employment report, over half the nation’s solar workers spent the majority of their time on residential projects in 2016. This trend reflects the need for mid-level positions such as solar marketing specialists and residential solar service technicians. In the wind sector, 29% of jobs fall under the manufacturing industry. Logisticians and buyers are necessary to manage the supply chain of components manufacturing and help make efficient turbines a reality. Experience the excitement of the Solar Decathlon 2017 October 5–9 and 12–15, 2017, in Denver, Colorado at the 61st & Peña Station on the University of Colorado A line commuter rail. In addition to touring the houses, visitors can visit the Sustainability Expo and attend consumer workshops. Those who cannot attend in person can “virtually visit” by touring the houses, seeing daily videos of the event, and interacting with social media. Linda Silverman is director of DOE’s Solar Decathlon. Olivia Wolford is a summer intern at DOE, and is a rising senior from Texas A&M. This entry was posted on Monday, July 10th, 2017 at 2:24 pm and is filed under Solar Decathlon.